The EOS M10 Compact System Camera combines Canon’s most advanced image processor, DIGIC 6, an 18 Megapixel APS-C sensor, and Hybrid CMOS AF II to deliver responsive handling and stunning image quality in both stills and Full HD Movies. 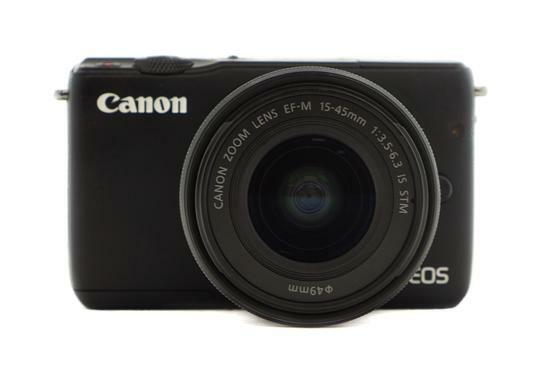 Canon EOS M10 Mirrorless camera in good condition, showing some minor signs of previous use. This kit comes with a Canon EF-M 15-45mm f/3.5-6.3 IS STM lens, wide stap, camera battery, charger and LowePro soft case. Whether its holiday action or kids on the go, the EOS M10 is perfect for capturing speedy or spontaneous moments. The cameraâ€™s 18 Megapixel APS-C sized sensor allows you to obtain real nuance in detail, creating stunning photographs which stand out from the crowd when printed or shared. Thanks to Hybrid CMOS AF II and a 49-point AF system, the EOS M10 can focus accurately in an instant and shoot movies with continuous focus to ensure nothing is missed. When used with compatible lenses, including the EF-M 15-45mm f/3.5-6.3 IS STM, Dynamic IS stabilises camera shake for steady footage when shooting on the move. While a number of lenses and accessories are designed specifically for the EOS M series, you can be as creative as you want to be as the EOS M10 is also fully compatible with over 70 of Canon's EF and EF-S Lenses (with EF-M Adapter, sold separately) plus other EOS accessories like Speedlites. The LCD screen on the EOS M10 is one of this camera's most exciting feature. The easy-to-use capacitive touch panel screen is 3.0 inches, and high resolution ensures a crystal clear display. Best of all, you can set it to multiple angles, including a 180Ã‚Â° tilt that's perfect for selfies. When the LCD is turned to this position, an icon for the new Self Portrait mode will appear. Simply touch to smooth and brighten skin, create beautiful background blur, even activate a self-timer. Then just snap and post! The EOS M10's intuitive & large 3.0Ã¢Â€Â high-resolution touchscreen delivers simple creative fingertip control, with easy access to camera settings and functions. Displaying fine detail (at approximately 1.04 million dots), this screen is perfect for composing and reviewing images. Auto: In One-shot AF mode with evaluative metering exposure is locked when focus is achieved. Manual: By AE Lock Button in creative zone modes. AWB, Daylight, Shade, Cloudy, Tungsten, White Fluorescent light, Flash, Custom. White balance compensation: 1. Blue/Amber +/-9 2. Magenta/ Green +/-9. Tilt type 7.5 cm (3.0Ã¢Â€Â) Touchscreen LCD (TFT). 3:2 aspect ratio. Approx. 1,040,000 dots.